RSVP Today to Serve as a Hero! They will need to arrive between 6:30 p.m. and 6:45 p.m., no later than 6:45 p.m. – to have time to eat their free Moonlite BBQ meal, and get into costume. PLEASE ASK THEM TO NOT COME IN COSTUME ALREADY! Their presence will be a surprise and treat for our guests, and they will be introduced in Superhero style by our Emcee prior to the Live Auction program starting. They can come wearing shorts and a t-shirt or whatever is comfy for under their costumes – it will be warm with 450+ people in the Sportscenter, especially if they are moving around. They can come in the main entrance, go to the check in and tell them they are there to help as spotters the liveauction, and need to talk to Maggie Price. Once all four are there, the Check In staff will notify Maggie to come get them and show them where to enjoy their volunteer meal and put on costumes. They can put on their costumes over their clothes in the volunteer meal room, and leave belongings there – but we recommend they NOT bring valuables in with them. Maggie Price will make sure they understand what they are doing in helping the auctioneer spot bidders, how to do that, etc. She will also make sure they are in position for their entrance upon their introduction. The superheroes need to be outgoing, willing to yell out to the auctioneer there’s a bidder trying to get hisattention, and willing to interact in a positive Superhero manner with the crowd. There will be a point when we do Feeding Frenzy and Fund an Item where they will have a bit of a break to hang back until live auction item bidding starts up again. The Live Auction portion of the program is what they help with in spotting. 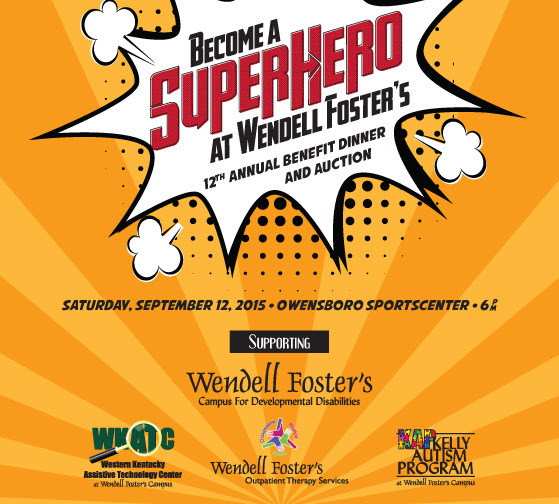 Our 12th annual benefit dinner and auction takes place Saturday evening, September 12 at the Owensboro Sportscenter. This year’s theme is Become a Super Hero! During our live auction portion of the evening, we usually have “spotters” who help our auctioneer locate people interested in bidding on these items. We were thinking this would be a great opportunity to have 3-4 “superheroes” to help volunteer for this task! The Superheroes must be vigilant in scanning the crowd for guests raising their paddles. They must be willing to make their presence known by bringing these folks to the attention of the auctioneer to get his attention! They must be feel comfortable “working the crowd” in character without being too distracting from the bidding action that is happening. We’ll have the emcee introduce them to the crowd, announcing they will be helping spot bidders, and have them all come out at once with a grand entrance.They must be willing to interact, pose for selfies, and acknowledge “superheroes” who generously support the cause we are fighting for during the evening – empowering people with development disabilities!